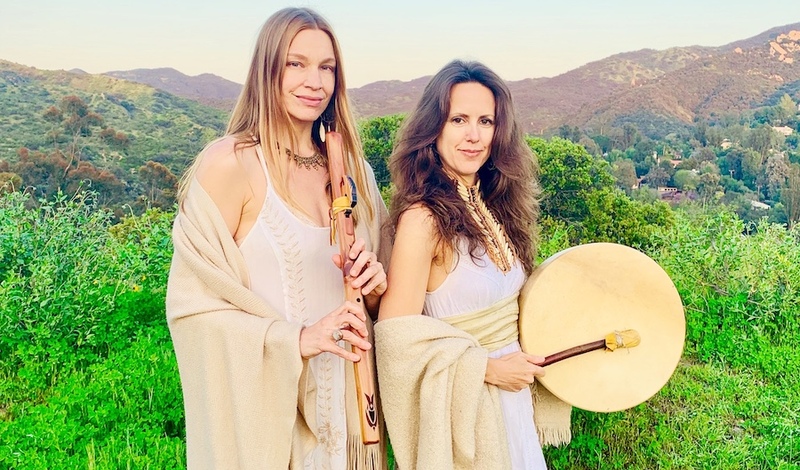 Heart Medicine – is a singing duo comprised of Annmarie Soul and Karen Seva – blending original songs, mantra and native tribal chants. Together their voices blend in harmonic frequencies creating angelic overtones inviting the listener into a deep musical meditation journey. The music of Heart Medicine is a combination of sacred songs and melodies inspired by nature and spirit, interwoven with healing mantras celebrating many traditions. Both celestial and earthly, each song is a gift from the muse of spirit, channeled and lovingly crafted – opening a doorway to the unseen, requesting our presence in a dance with the divine, inviting us into love, and calling our hearts home. Annmarie Soul is a yoga teacher, healer, and singer songwriter bringing light to this planet through the healing power of music, prayer, and connection to the divine. She is based out of Los Angeles’s beloved Topanga Canyon where she is nestled in nature and wildlife, and sources strength from the quietness and peace of the native Chumash mountains. Nature is Annmarie’s biggest inspiration, where she receives healing and guidance, and from that place, universal energy comes forth. Annmarie has been teaching yoga for over 15 years and loves to bring people on pilgrimages to sacred sites, temples, and high vibrational places to have a rich and life altering experience. Annmarie has taught and performed at many festivals including Bhakti Fest, BaliSpirit Festival, Lightning in a Bottle, and Moksha Festival. She has songs in films, and has most recently released her album Back To The Garden. Annmarie is currently working on her new album titled Illuminate set to be release this year 2018. Karen Seva MDiv. MSW CPC is a best-selling author, healer, teacher, life coach, musician, activist and mom. Karen began singing before she could speak and became deeply connected with devotional practices and a profound love of the Divine from a young age – which lead her to meditation, psychology, mantra, shamanism, Naam Yoga, energy healing, sound healing, ancient wisdom practices and deep love of the earth & of the Divine Mother. Seva means Divine Service – and this has been Karen’s life path. She has combined these disciplines to form a unique approach to working with individuals, families and groups to assist them in finding their voice, accessing their highest potential and doing the greatest good for the world. Karen is also the founder of “Sing the World Awake!” – a motivational music and movement program for children and families. She has conducted children’s concerts for the Dalai Lama, the Agape Spiritual Center, Native Elders as well as Spiritual Leaders from around the world. In addition, she is the founder of the International Children’s Day Event – Children Sing for the Future, which unites children & adults around the world in singing for World Peace. Karen’s best-selling book, “The Awakening World: The Return of the Divine Feminine” was released in January of 2017.